Congrats to Dalhousie alumnus Arthur McDonald (BSc’64, MSc’65, LLD’97), co-recipient of the 2015 Nobel Prize in Physics. Dr. McDonald is being recognized along with Takaaki Kajita of Japan for his key contributions to research showing that neutrinos can alter their identities, a discovery that has helped recast the fundamental scientific understandings of how matter works. 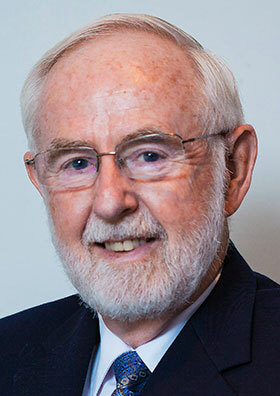 Dr. McDonald began his long and distinguished scientific career at Dalhousie, graduating with a Bachelor's degree in Physics in 1964 and a Master's degree in physics in 1965. After completing his doctoral work in physics at the California Institute of Technology in 1969, Dr. McDonald spent time as a researcher at the Chalk River nuclear research facility and a professor at Princeton University. McDonald moved on to Queen's Univeristy, which is where he has carried out some of his most groundbreaking work at the Sudbury Neutrino Observatory. According to The Royal Swedish Academy of Sciences in Stockholm, which awarded the prize on Tuesday, Dr. McDonald's research demonstrated that rather than disappearing on their way to Earth, neutrinos had changed their identities by the time they reached the observatory. Dr. McDonald received an honorary degree from Dalhousie in 1997 and, ten years ago today, was on campus to delivered the 2005 E.W. Guptill Memorial Lecture at Dalhousie's Department of Physics and Atmospheric Sciences.